In our last regular episode before summer break, we gather to talk about community: not the hashtag or the social media version, but the essence of community as a sense of place and belonging. Host Kayla Craig is joined by Lindsy Wallace, Shannon Evans, and special guest, Rebekah Troche, who lives at Jesus People USA, a church and intentional community in Chicago. Learn about JPUSA’s mission and ministry and why Rebekah was drawn to it; Share our vision for this fall’s Upside Down Gathering; Talk about how vulnerability and trust play a role in community; Bring forward tangible ways we can begin to cultivate community; and we Tackle listener questions about how to deal with conflict and how an introvert can find respite amid a community-building lifestyle. 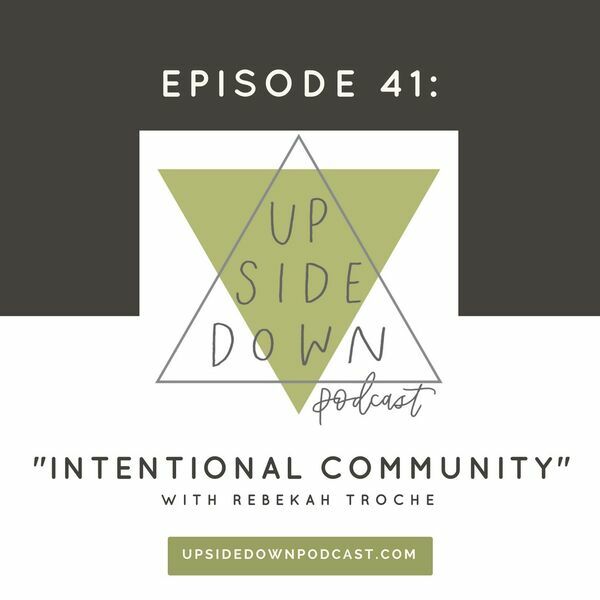 Join us as we recognize how intentional community with others is pivotal to the upside-down life. We’re opening the doors to Wilson Abbey in Chicago for the first-ever Upside Down Gathering on Sept 21-22, 2018. Get your tickets at upsidedownpodcast.com/gathering. We’ll be back in September with brand-new episodes! In the meantime, we’ll feature short sessions and one-on-one conversations with creators and makers in God’s Kingdom, one in June, one in July, and one in August. To have access to those episodes, join our community of $10/month supporters on Patreon: patreon.com/upsidedownpodcast. To have access to a download with tangible, creative ideas to be a more present neighbor right where you are, join our community of $10/month supporters on Patreon: patreon.com/upsidedownpodcast.